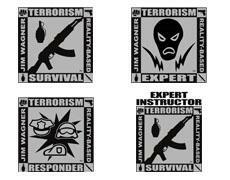 Teach your students how to survive crime and terrorism. You already have the infrastructure in place to do it. Do you want to teach others self-defense: your family, friends, coworkers, or your own students if you run a self-defense school? To be a certified RBPP instructor requires taking only two courses: the course of your choice, and its corresponding instructor course. Again, the RBPP system is modular and each instructor has different goals, which works to your advantage. 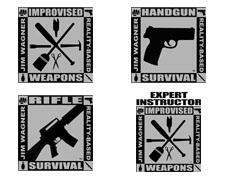 Perhaps you only want to teach people how to survive the most common terrorist attacks. Then all you would need is to take is the Terrorism Survival course as a student, and then the Terrorism Survival Instructor course for your instructor certification. However, if you want to offer your students the complete Jim Wagner Personal Protection Core Curriculum then all twelve courses will give you the knowledge and skills to achieve this. For many traditional-based martial arts instructors this concept is hard to grasp, because in the traditional-based martial arts it takes years to get to instructor level. 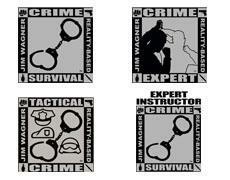 However, the Jim Wagner Reality-Based Personal Protection system is modeled after the police and military way of certifying instructors. An instructor is someone who was taught a fixed set of information, tactics, and techniques and they have demonstrated the ability to pass it on to others. Learning how to hit the deck and cover up when a terrorist lobbed a hand grenade at one’s feet takes only minutes to master. Learning how to teach the Hand Grenade Defense technique from the RBPP system takes very little time. Add up all the easy-to-learn and easy-to-teach information, techniques, and tactics in these 12 courses, and you have a system that can be duplicated with a proven track record. Each course is one day of training (8 hours). Becoming a certified Jim Wagner Reality-Based Personal Protection Instructor gives you the privilege of being listed on the official RBPP website as an instructor (along with your contact information if you want), permission to use the course logos you have been certified in, and to be on the instructor mailing list to be notified of any changes or updates in the system. Some instructors will want to go as deep as they can into a subject matter for their own knowledge and/or to offer more techniques and tactics to their students. They want to be the best. It is for this reason you can become an Expert Instructor in the subject of your choice or all of them if you prefer. The first step is always is to start with a course from the Reality-Based Personal Protection Core Curriculum, which you can take in any order you like. The second course continues your “war arts” education with a lot more information, techniques and tactics. The second course always compliments the first course. The third course is designed to help you teach professionals that will inevitably be in your future courses, because the RBPP system attracts professionals because of its realism and effectiveness. “Professionals” are those men and women who keep us safe: corrections officers, law enforcement officers, bodyguards, private security, and so forth. In this course you’ll be getting material that the general population need not know or need to learn. The fourth and final course is how to teach everything you’ve learned from the first three courses, and more. The first course is one day of training (8 hours), the second course is 6 hours of training, the third course immediately follows the second course, and it is 2 hours of training, and the fourth course is 8 hours of training. If you complete all of the Instructor courses, the 12 courses, then you will be honored and listed on the official Jim Wagner Reality-Based Personal Protection website with the title of Elite Instructor. 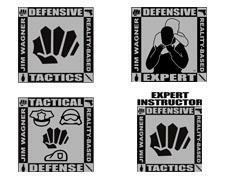 Your students will know that you are able to teach all six courses of the Reality-Based Personal Protection Core Curriculum. 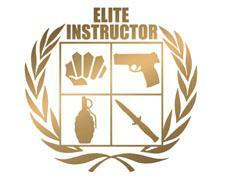 The Elite Instructor logo, when displayed in color, is symbolized by the color of bronze. Some instructors want to offer self-defense courses just for women, and Women’s Survival has been one of the most effective and publicized courses since 1986 when it comes to women’s self-defense. 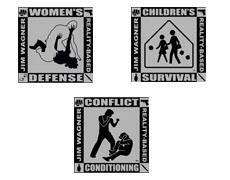 Many self-defense schools rely on the enrollment of mostly children to keep their business healthy. Children’s Survive will add new material to your program that few instructors teach, like surviving a school shooting or tricks criminals use to lure in their young victims. It’s a program designed for kindergarten age children all the way up to high school, and it can augment your current program. Conflict Conditioning is 50 different exercises and drills from around the world that will breathe in new life into your current training program. With these three additional courses, after completing all of the Reality-Based Personal Protection Core Curriculum instructor courses (a total of 15 courses), you will earn the title of Professional Instructor and be listed as such. 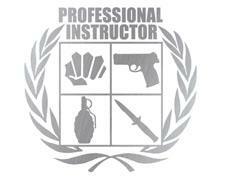 The Professional Instructor logo, when in displayed in color, is symbolized by the color of silver. 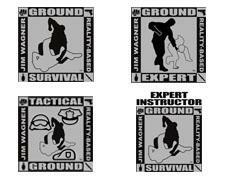 Any instructor who completes all 27 courses is deserving of the title Master Instructor, because he or she has indeed “mastered” the Jim Wagner Reality-Based Personal Protection system. Obviously, few people ever reach this level. The Master Instructor logo, when in color, is symbolized by the color of gold. Start today. It’s as easy as 1-2-3. If you are an established self-defense school, or a security organization, Jim Wagner will come to your school and teach you privately (up to 10 instructors in a group) for the price of one anywhere in North America, Europe or Australia. Not only can you become a Terrorism Survival Instructor, but there are other instructor packages to choose from to expand your business opportunities. If you’d rather go to Los Angeles, where Jim Wagner is located, then you can receive private lessons directly from him there. During your stay you can enjoy the beaches, Hollywood, Beverly Hills, the original Disneyland, and other attractions on your free time. 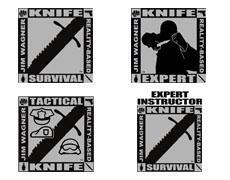 Once you are instructor certified you can advertise to the world that you are an official Jim Wagner Reality-Based Personal Protection Terrorism Survival instructor, or whatever instructor package you choose to be certified in, and you will get the full support of Jim Wagner and the RBPP system (legal use of the logos, training materials, and be listed on the official RBPP website as a certified instructor). Or, if you prefer, you can teach independently and nobody needs to know where you got your techniques, tactics, and training methods from. It’s entirely up to you on how you want to market yourself and your business. And, here’s even better good news. Certified RBPP instructors are not required to pay Jim Wagner or the RBPP organization a percentage of their earnings or a yearly fee for teaching the system as so many other systems require.